The great thing about a lighted rocker switch is that you’ll always know when the circuit is closed. 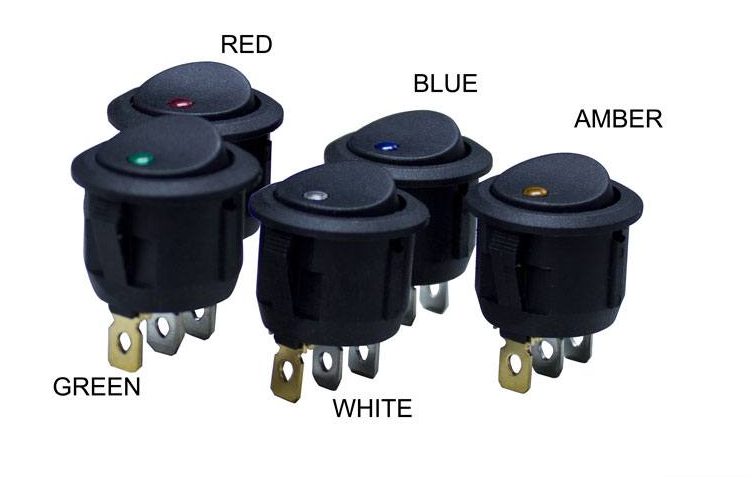 So to ensure you always have this convenience, there are a few steps you’ll need to take to ensure your lighted rocker switch is properly wired up and will light up when you switch it on. Hook up your first power wire from the terminal of your led to the power connection on the switch. The second power wire will be connected from the accessory connection of the switch to the battery. Connect the first ground wire from your led’s terminal to the ground connection of the switch. Connect your last wire from the switches ground connection to the battery. Hi all – great forum! I need a lighted rocker that I can I make the negative wire the one that is switched. Is there a lighted rocker that has the indicator light separte from the switch? Thanks! just reverse your normal hookup. and you can make your own. use an led and a plain rocker. if you need clarification, ask. Yep – what Kevin said. All a switch does is create a “break” in the circuit that interrupts the flow of electricity. With a switched ground, you connect the accessory to the 12V positive directly and put the switch on the ground wire – when it’s flipped off the connection to ground is broken and current cannot flow.